Jim von der Heydt is a Principal of Warson Capital Partners with many years of experience as an innovative business leader with a diverse background in highly competitive global industries. Jim’s experience as a creative strategic advisor, corporate manager, investor and entrepreneur equip him with a unique talent to transform ideas into profits. 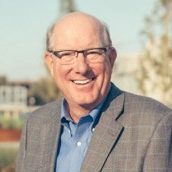 Since 2002, Jim has operated InnoVentures, a consulting firm he established to provide strategic planning, product development and capital strategies for growing companies. InnoVentures’ services include roles as advisor, founder, director and investment banker, including Founding President and CEO of Nawgan Products, Director of Clayton Capital Partners, Chairman of D.D.S. Technologies USA, founding member of the St. Louis Arch Angels, strategic planning and product design services for Ainsworth Pet Products, product design services for Wal-Mart, and strategic planning services for The Donald Danforth Plant Science Center and The St. Louis Symphony. As a consultant, Jim has contributed to the creation of more than $800 million in new products. Jim served in key leadership positions with Ralston Purina Company (now Nestle Purina) from 1981 through 2002. As Executive Vice President for Global Research & Development and Business Development (1996-2002) his global business development efforts included strategic acquisitions for the Pet Products Division. In this role he also led worldwide R&D including 165 professionals in five locations across three continents, and served on the senior management team as one of four EVPs of the Company. Prior to this position, Jim served as Executive Vice President for Pet Food Marketing and Research & Development, with responsibility for all domestic product management activities, R&D and marketing research for the Pet Products Group, providing $2 billion in sales, $300 in operating profit and $300 million in marketing spending. Jim shares his time and talents with a variety of industry, academic and not-for profit institutions including serving as Chairman of the Pet Food Institute, Director and Vice President of the Humane Society of Missouri, member of the Foundation Board of Trustees of the St. Louis Zoo, Board Member of the Center for Business Ethics at St. Louis University, Board Member of the Central Institute for the Deaf at Washington University, Chairman of the Friends Society at the Danforth Plant Science Center, Board Member of iTen in St Louis, and Vice Chairman of St. Louis Altenheim. Jim holds a BS from Drake University, and an MSJ from Northwestern University.